In 2005, some middle schoolers were idolizing Gwen Stefani, Usher, and Vince Vaughn. But 10-year-old August Schetter, a Future Farmer of America, was excited about the work of Dr. Thomas B. Voigt, Illinois Professor of Crop Sciences. Left to right: August Schetter, D.K. Lee, and Dong Ha Son. Today, Schetter, an M.S. Candidate in Crop Sciences at the University of Illinois, works alongside the people he read about as a kid. Schetter, from Brighton, Ill., has had a lifelong interest in farming, research, and technology inspired by his family’s passion and history in the industry. Schetter’s experience with native Midwestern grasses makes him a perfect fit for his current research project with the Center for the Advancement of Biofuel and Bioenergy Innovation (CABBI). Schetter works on D.K. Lee’s Prairie and Bioenergy Lab, which is part of CABBI’s Sustainability theme, studying sorghum, Miscanthus, and switchgrass. Schetter’s current work involves nitrogen use efficiency trials. Liquid nitrogen fertilizer, at different rates, is injected into the ground between the rows. Once they’ve completed this process, team members go through the rows and use an instrument to determine how much light is penetrating the crop canopy. Determining the light penetration gives them the leaf surface area index and an understanding of how fast the plants are growing. The plant tissue nitrogen, specifically, is analyzed biweekly; however, the team is constantly between the field and lab collecting data on plants. Lee’s team is small but mighty, with just a handful of graduate, undergraduate, and postdoctoral researchers bringing a variety of strengths and knowledge to the table. 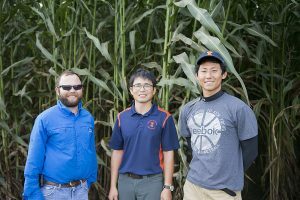 The team works at the University of Illinois Energy Farm and closely with Texas A&M University, which provides the seed stock. The team’s research also looks at marginal land — land that has poor soil quality, something that Schetter is familiar with. 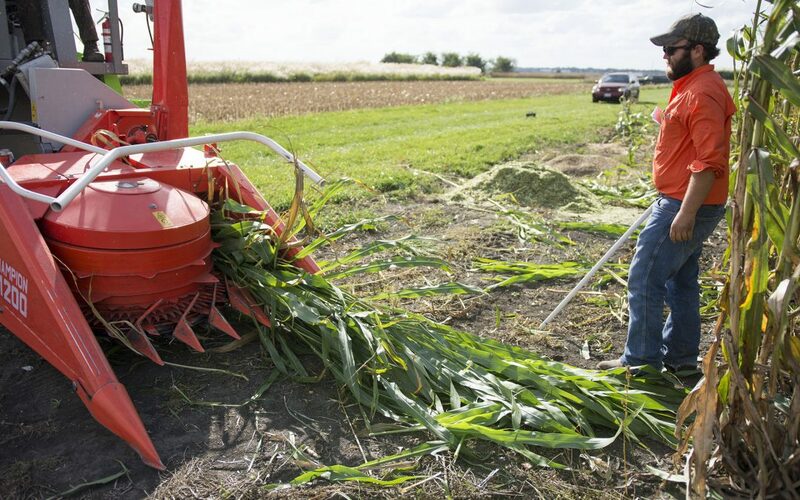 Growing viable crops that can produce biofuel on marginal lands provides farmers with an economic option that does not compete with food agriculture. The end use for the crops planted through CABBI is biofuels and bio-based products. “If you are able to get a crop like sorghum that produces for a profit, and has lower environmental costs, it’s going to be an incredible contribution to and stimulator for agriculture,” Schetter said. The collaboration between the CABBI themes has been inspiring as he attends meetings and gets to know other researchers. When Schetter isn’t attending a Crop Sciences class, harvesting sorghum, and analyzing nitrogen he has a few hobbies he’s passionate about … on the farm. 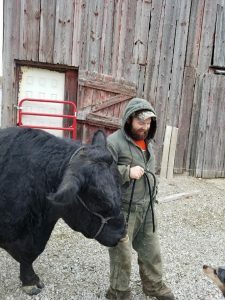 He heads back to Jersey County on weekends and breaks, as time allows, to tend to the Angus cattle and prep hay for sale. Schetter is optimistic about the future of his team’s work, which he readily admits is in the beginning stages. Luckily, the team features a graduate student with data going back to middle school.